Lori at Fun For First is having a linky party! I know this feeling too well! 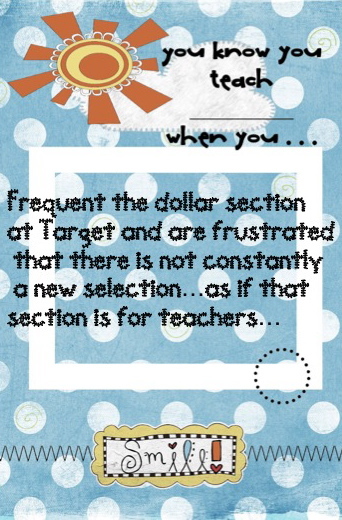 Anytime I stop at Target or the Dollar Tree I expect wonderful new items that I can use in my classroom... and when there is not anything new or that I can use, I get frustrated too! I think they need to have a Dollar Teacher Store! OMG!! That is so me!! Hi Michelle! Thanks for linking up and also thanks so much for the top 10 award! So sweet :) Also, I am your newest follower!